This is a great house, whilst typically Eressian in layout, boasting3 bedrooms, it's larger than most. Leading up the somewhat overgrown pathway, the walled garden has an enchanted feel to it. The house doesn't disappoint either; large hallways and landings, original doors, floorboards and windows gives the sense of an old school house. It's very atmospheric....in a good way! If you fancy a bit of DIY but you don't want the hassle of major renovation then this is an ideal property. It's a solid house and the windows, doors and roof are in excellent condition. It needs a new bathroom and kitchen and a lick of paint and voila, you'll have an amazing home. It's situated literally a 2 minute walk from the traditional square which is the heart of this wonderful little Greek village. Boasting all of the attendant amenities, cafes, tavernas and shops, most of which are open year round. A rather grand hallway leads to the downstairs area. To the front of the house is a living space with views onto the garden, deeps sills and wide, wooden floorboards give the whole thing a rustic and charming feel. KITCHEN. This is something of a misnomer. There's a sink made from pebbles and a plate rack indicating this was once a kitchen area (Miss Marple has nothing on me.) There's a room next door which was probably storage, it would be worth knocking through and creating a good sized kitchen/diner. BATHROOM. There's more of the pebble/mosaic effect in one corner providing a shower. There's a sink and WC. It needs a new floor and a bathroom suite. BEDROOMS:A wooden staircase leads to a large landing. There are 2 bedrooms separated by double doors (get a lock on there if you've got swingers visiting) Again there's the wonderfully rustic feel to the whole place. Lean out of the window far enough and you'll catch a glimpse of the sea! Dividing the two rooms is a large hallway/landing. It's nice and light due to two large windows at the head of the staircase. This would be ideal as a study/hobby area or a further living space. There's a further bedroom with sink. It may be worth considering placing the bathroom up here and using the downstairs area to create a large kitchen/diner although you would lose a bedroom. There's a separate WC too, very handy! Parking is approx 15metres from the front gate. This listing has been viewed 3 times. 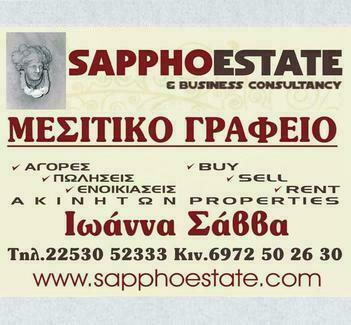 Copyright © 2019 Sappho Estate - Lesvos Island Real Estate Agency. All Rights Reserved.